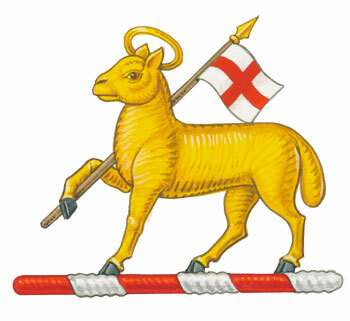 The Paschal Lamb was the chief emblem in the Regimental Insignia. It was worn alike by officers and other ranks both as the cap badge and as the collar badge. It was also borne in each comer of the Regimental Colour. The origin of its adoption is obscure,but since early days, it has been identified with the Regiment. Some authorities, including Macaulay, have suggested that as the Regiment was formed in 1661 to garrison Tangier – part of the dowry brought by Catherine of Braganza on her marriage to King Charles II – the badge was taken as a Christian emblem in the struggle against the infidel Moors. Others have attributed its adoption to the fact that, in one portrait, Queen Catherine is depicted with a lamb in the foreground. It seems fairly clear, however – from the early drawings of the Colours – that the badge, was not adopted until after the return of the Regiment from Tangier in 1684. The first known instance of the Regiment wearing the Lamb as its badge appears on the Carlisle figures dating from about 1715, presented by Colonel R. O. Clarke, C.M.G., D.S.O., M.B.E. .History of The Queen's Royal Regiment - Volume IX, Major R C G Foster MC.